Before my first trip to Mexico for a an international writers congress in Gualadajara I didn’t know anything about the country. I didn’t even know that my scientist colleague from Slovakia had been staying in Mexico City for a year, and when I did discover it and decided to contact him it looked hopeless. He didn’t answer my fax messages. Later it became clear why. Someone had stolen the fax machine from the office of department where he worked. My telegram, which took my laboratory’s quarterly budget for post costs, was never received. E-mail connection we hadn´t and the letter I sent would almost certainly arrive too late. But against all odds, the letter arrived sooner, a day before my departure from Slovakia. Thanks to this, my colleague called in the last minute and we had a chance to exchange information how to meet at the airport. And I flew. My colleague kept his promise of providing a way station on my trip to the unknown. He welcomed me at airport and introduced me to local beer Montejo and Mexican soup called pozole. He told me in detail what I could, might, or could not do and in the evening took me to the bus headed for Guadalajara and dispatched me. Those who have traveled on overnight Mexican bus lines know that it is a luxury that we don’t have in Europe. Therefore, I should have felt comfortable, but I didn’t. In the highway toll booths I saw soldiers, but also strange-looking civilians in ponchos with guns in their hands as though they were on the front lines of a war. I didn’t sleep much en route to Guadalajara. It was about five in the morning when I arrived in the Guadalajara bus station. My first 12 hours in Mexico I had seen mostly the interior of a dark bus. Now, I waited nervously at the uncharming stand of prepaid taxi service. 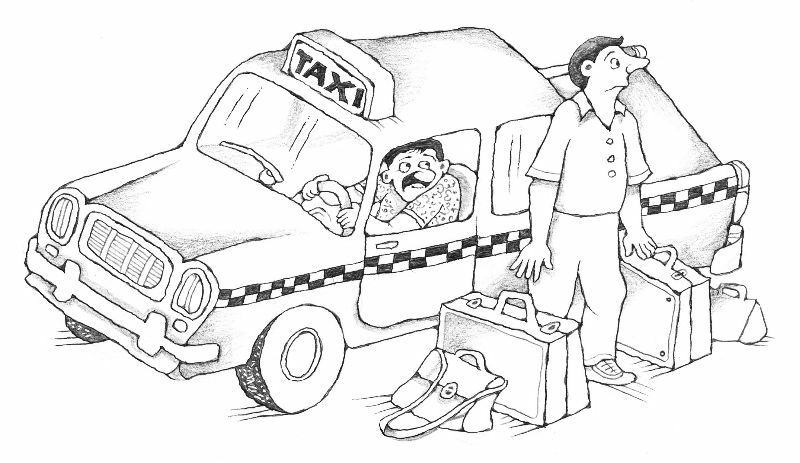 My colleague had warned me vigorously that at this stage of a journey a foreigner has two problems: not to be robbed when paying for the taxi and, more importantly, not to be robbed while you are in the taxi. Thanks to his advice to use the “pre-paid taxi” service in the bus station, the first didn’t happen and the second I awaited apprehensively in the back seat of the old taxi. I knew that my Danish colleagues were once robbed in the center of Mexico City. On their way back to their hotel from a night raid to the famous cantinas a small green taxi with a state license took them to a dark park where the driver’s accomplices were waiting to ambush them. It was clear that dark park is the worst place to be driven by Mexican taxi. I was dwelling on this issue, looking suspiciously to dark streets outside when it happened! Taxi stopped at the corner of an abandoned park. The streets of Guadalajara were empty all the way here and so was the park. I started sweating. I looked around from where an attack will come. But there were nobody else around. Sooner I can got really scared I realized that I am dealing with a completely different problem. At the beginning of the journey I had told the taxi driver the name of my hotel, Plaza del Sol. And that good man really took me there, but to a square with a park called Plaza del Sol. At 5:30 a.m. he stopped and, with a sweeping international gesture, showed me that we had arrived. I knew that I am in a completely unexpected trouble. I had no other point of orientation in the sprawling city of Guadalajara, with its millions of people – only the name of the hotel Plaza del Sol, which was unfortunately the same as that of the deserted square and park. I had nothing else up my sleeve. Taxi driver didn´t speak English and I don´t know Spanish. I had no desire to get out of the taxi with my luggage either. But what could I do except feebly repeat the name Plaza del Sol, to which driver nodded agreeably and offered to help me out of the taxi. In chess we call it a stalemate. In the morning shadows I looked around. Here I was, in this unknown country, in this unknown city, about thousands kilometers from home, seeking for some sign from heaven, something to light my way. And I found it. The taxi had stopped near a row of small buildings that formed shorter side of the square. All were shops or restaurants, and all were closed and dark. Only one, near where we were parked, had a shining neon sign with one word on it – “Slovensko”. At first I thought it was hallucination caused by my lack of sleep. This sign was not part of this world. It was really written in the Slovak language. It wasn’t in English, “Slovakia”, or Spanish, “Eslovaquia”, but our domestic Slovensko. Just some Slovak who had lost his way here long before me could only have written it. Someone who has survived here and built a homage to our native land. Looking at this neon message I realized that I simply couldn’t lose here. And that hotel with the unfortunate name “Plaza del Sol” we found just around the corner.